Right now I am all about beauty products that combat the effects winter - so anything brightening and moisturizing is an instant winner. 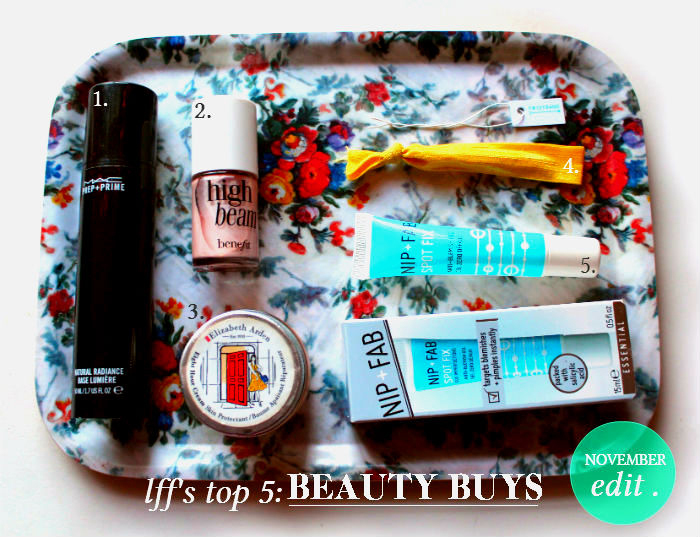 November's top 5 beauty buys are a combination of classics that I have used for years, but have come into their own now the temperature has dropped, and new products that have revolutionized my morning routine and left me wondering how I ever coped without. 1. Mac Prep + Prime Natural Radiance, £29. I only discovered primers this year, but now I am hooked. Mac's Natural Radiance primer contains illuminating pearl powders that reflect optic brightening. Put simply, it's can make my skin look fresh and dewy even when I'm over-worked, over-stressed and (occasionally) hungover. 2. Benefit High Beam, £19.50. This pearly pink liquid highlighter is one of my all time favourite beauty products. I rub a dab on the apples of my cheeks each morning before applying my powder blush to add radiance and luminosity. On a practical note, it also happens to help my blusher 'stick' and last all day. 3. Elizabeth Arden Eight Hour Cream, £25 for 50ml. Thanks to my mum, I have been using Elizabeth Arden Eight Hour Cream since my teens. However it's in winter when my skin turns into lizard-like scales that it really comes into it's own. Great for wind-chapped hands and cracked knuckles, this balm-come-cream moisturisers, soothes and protects like nothing else I have tried. 4. Twistband, £10 for a pack of 3 from Birchbox UK. A hair bobble that doesn't leave kinks in your hair? Not possible you might think. But having tried and tested the Twist Band I can report that this US beauty phenomenon is well worth the hype. I used it to tie up my freshly washed hair and it remained kink free after several hours - a wonder product. 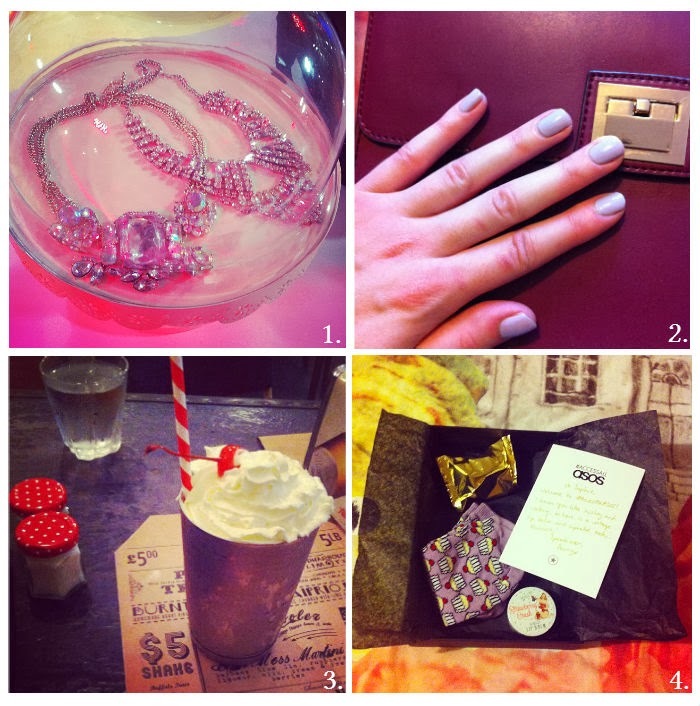 Thanks to Birchbox UK at The Apartment for introducing me to this over London Fashion Week. 5. Nip + Fab Spot Fix, £9.95. I have never been one to be concerned about break outs, but this month I have suffered some really painful inflammations that were impossible to ignore. Normally I would just leave my spots alone, but the Nip + Fab spot fix was lying unused in my draw so I gave it a go. I dabbed on the gel at bedtime and was surprised to see (and feel) visible results when I woke up. Most importantly the throbbing pain of a fresh spot that I am sure we are all familiar with disappeared much quicker than usual, kudos to Nip + Fab! .......Do let me know if you've discovered any wonder products this month too, I'm slowly becoming a beauty junkie and love to hear new suggestions! 1. Jacquard prom dress, George at Asda, £25. 2. Lace sleeved dress, Next, £60. 3. Iris & Ink dress, The Outnet, £195. 4. Vivetta red wool dress, Avenue 32, £300. 5. Fendi metallic leather flats, Net-a-porter.com, £560. 6. Jewel earrings, ASOS, £8. 7. Lip bullet in Wine Gum, Topshop, £8. The festive season is pretty much here, so when Warehouse kindly offered me a dress to review, I knew I needed a party-ready piece. 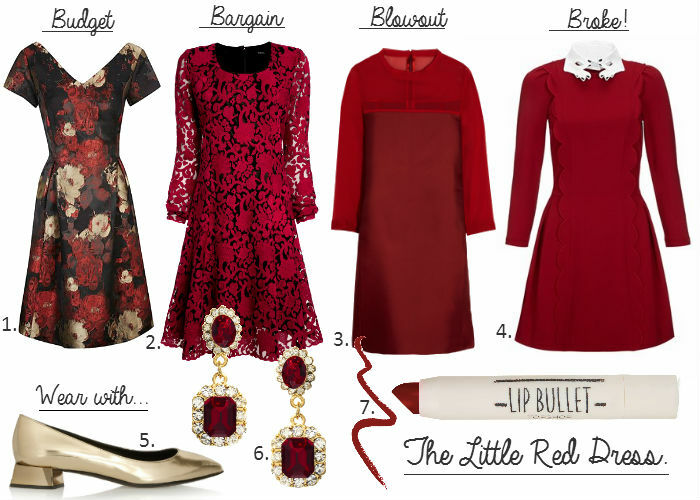 If you are struggling to find you Christmas party dress, I recommend checking out Warehouse - I think their offering is one of the best on the high street this season. 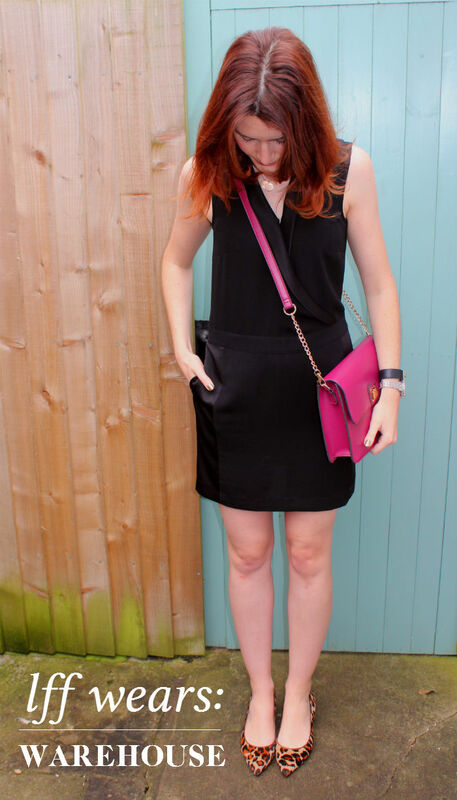 I picked the black tuxedo dress - I am all about minimal and simple dressing at the moment and this piece is formal without being fussy. It also reminded me of the Victoria Beckham tuxedo dress from her AW13 collection that Diane Kruger has been seen wearing on the red carpet. 1. Joules Harbour t-shirt, Surfdome, £29.95. 2. 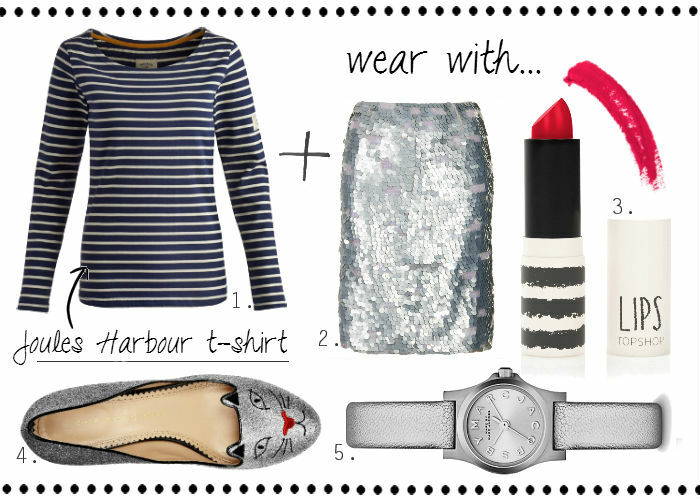 Silver sequin skirt, Topshop, £95. 3. Lips in Screen siren, Topshop, £8. 4. Charlotte Olympia glitter kitty flats, Net-a-porter.com, £495. 5. Marc by Marc Jacobs Henry watch, Bloomingdales, £120. The festive season wouldn't be complete without a dash of sparkle and Christmas 2013 sees a strong focus towards opulence. Forget sequins, this year it’s all about jewels. My favourite interpretation of the trend was seen in Henry Holland’s AW13 ‘Rave Nana’ collection where shift dresses were embellished with crystal cigarettes and jewelled cocktail glass motifs skimmed the hems of pencil skirts. An affordable and wearable way to introduce the trend into your wardrobe is with a jewelled earring – an accessory that looks just as great with a cable knit jumper for day as it does with a cocktail dress for after dusk. Even better, the high street has got this trend nailed for AW13, there’s no need to bother with designer when the purse-friendly alternative is this convincing. I bought pair no.1 (in the midnight blue hue) from Next last week and they are now in constant rotation in my jewellery wardrobe. 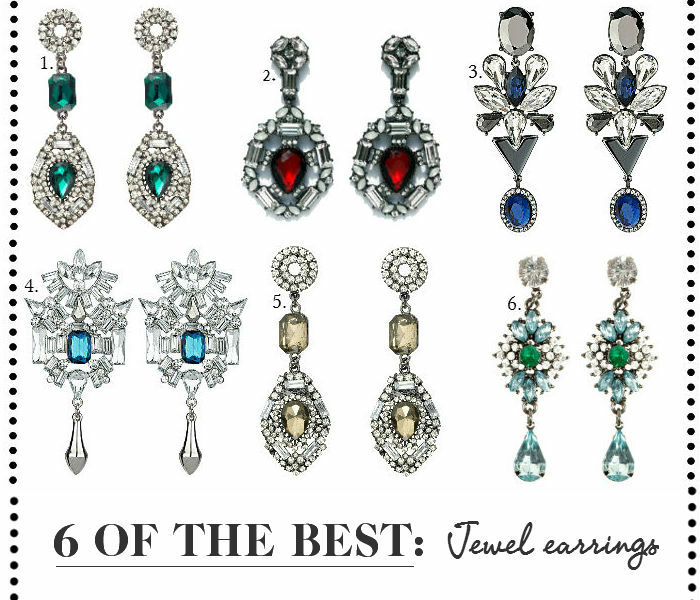 Will you be rocking a sparkling earring this festive season? 1. Emerald green & crystal effect earrings, Next, £12. 2. Statement crystal earrings, Anna Lou of London, £35. 3. Royal blue chandelier earrings, Dorothy Perkins, £14. 4. Chrystal chandelier earrings, Topshop, £20. 5. Smoky Quartz and crystal earrings, Next, £12. 6. Intricate jewel drops, Warehouse, £10. 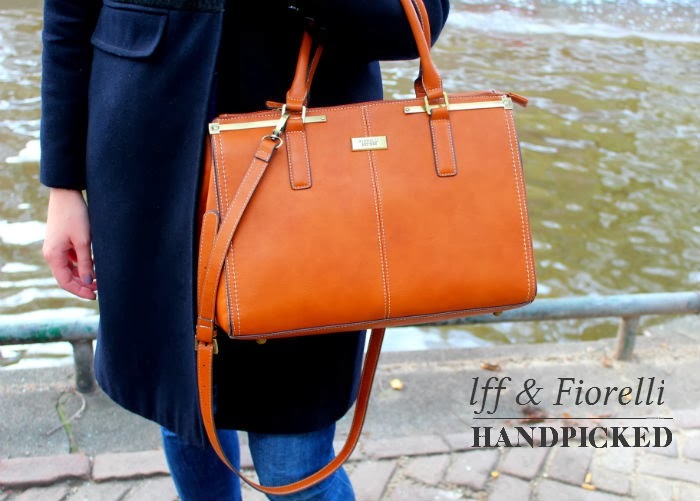 You may remember that I have joined forces with Fiorelli this autumn/winter to document my journey with the Jasmine bag the brand has partnered LFF with. So it seemed like the perfect time to test-drive my bag when I went on a mini 48 hour getaway to Amsterdam with my family last month. When you're only flying with hand luggage I think a stylish compartmentalised tote is essential for organising oneself in-flight, so my Jasmine bag proved to be the perfect travel companion. Only in winter is it socially acceptable to head home straight after work and clamber immediately into one's pyjamas. Thanks to this seasonally lazy disposition, lounge wear becomes a staple in my a/w wardrobe. Pyjamas and luxe slippers are top of slumber time essentials, but cosy sweaters, cashmere socks, yoga pants and silky camisole tops also offer chic lounge wear options. Whilst it can be hard to find stylish casual pieces on a high street budget (just say no to novelty slippers and onesie..) luxury UK brand Ruby + Ed stock an amazing collection of faux fur lined slippers (no.7) plus nightwear and accessories that feel supremely luxe to wear whilst affordably priced. Over at New Look, Kelly Brook's latest lingerie collection offers some pretty camis (no.2) and underwear sets on a shoestring budget. Whilst it isn't featured in my edit, I'm also a huge fan of the Rosie for Autograph range at M and S by Rosie Huntington-Whiteley has lots of beautiful silky separates which are worth checking out. What are your go-to loungewear essentials? 1. DKNY fleece pyjama set, Net-a-porter.com, £58. 2. Kelly Brook spot cami, New Look, £19.99. 3. Equipment heart print pyjamas, Harvey Nichols, £440. 4. Dreama check slippers, Joules, £14.95. 5. Mary Katrantzou for Rodial candle, ASOS, £35. 6. Orchid pink hot water bottle cover, Ruby + Ed, £29.95. 7. Cerise Leopard print ballerinas, Ruby + Ed, £39. 8. Corgi for J.Crew cashmere socks, £98. 9. This Works Dream Team sleep duo, ASOS, £10.